I was welcomed to Nepal before I even stepped foot in the country. Since I was flying Turkish Airlines, I had a layover in Istanbul on my way to Nepal. As I was waiting for my connecting flight, these two women struck up a conversation with me. They were currently living in the United States but were from Nepal and were returning to visit friends and family. They shared their advice, and gushed about how much I was going to love Nepal and how thrilled they were that I was visiting their country. I was greeted again and again with a friendly “Namaste” throughout Nepal. Though I did still need to adjust to the culture and their style of living. Attempting to cross the street was always a challenge, with buses, motorcycles, vans, tuk-tuks, and bikes zooming past in no organized direction. Sometimes there were even cows and stray dogs scattered in the mix as well. 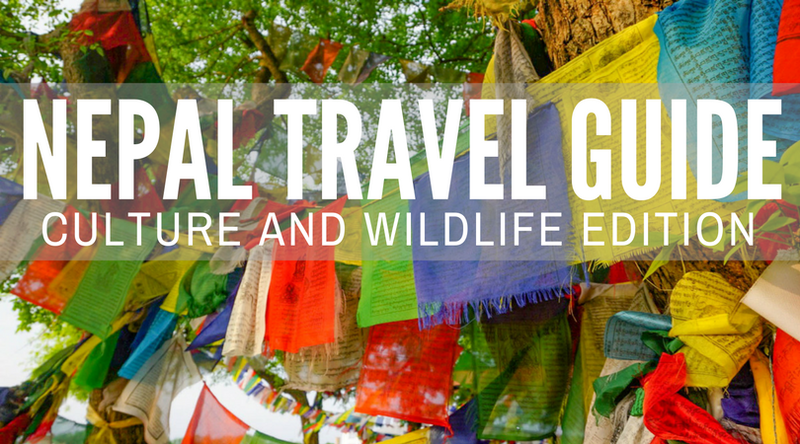 Prepare for your own trip to Nepal with this culture and wildlife Nepal travel guide. There is much more to Nepal beyond just trekking. To get around the country, you may choose to drive yourself if you want to brave the adventurous Nepalese roads, but I recommend opting for a tour company instead, like this 10-day discovery tour. Read on to discover my favorite places on my 12-day journey around Nepal! You’ll notice that the airport is close to the city center when flying into Kathmandu, but especially during peak hours traffic can make the journey take longer than anticipated. You can expect these two days to require some jet lag recovery time, especially if you are visiting from the United States. There is a lot of travel time needed to get to Nepal, so take some time to casually explore the city and rest when you need it. This is a great time to walk through the streets of Thamel, one of the most popular tourist neighborhoods in Kathmandu, and visit Durbar Square, a cultural goldmine of temples, palaces, and courtyards with intricate architecture and design. Kantipur Temple House is an eco-boutique hotel centrally located in Kathmandu in the neighborhood of Thamel and is only a 10-minute walk from Durbar Square. Complete with a garden and terrace, the authentic Nepalese architecture and décor of the building and rooms will get you into the Nepal spirit right away. The WiFi here was the best I had during my entire time I spent in Nepal, as they have multiple networks you can join if one is slower. There are also free daily yoga classes out on the lawn for a fresh start to your morning. Rates start at only $63/night on Booking.com! Keep an open mind when it comes to travel time in Nepal. Many of the roads are unfinished and twist through the mountains, so what might look like a quick trip on Google Maps could take a lot longer. It’s safari time! Home to the one-horned rhino, wild boar, royal Bengal tiger, langur monkeys, and many more jungle creatures, Chitwan National Park is one of the best opportunities to get close to nature and wildlife in Nepal. The entire area was previously a hunting reserve by the royal family before it became a national park. There are small boats you can take out onto the river with a guide to see some Gharial, a fish-eating crocodile. They were hunted for many years for their snouts, which supposedly has aphrodisiac qualities, but they are now under the protection of the Nepal Government. Tucked away into the Sal Forest just off the coast of the river is a Gharial Conservation Breeding Center. They started with 57 crocodiles in all of Nepal, and now have over 500 crocodiles in enclosures. In monsoon season, the water flows into India and the crocodiles don’t ever come back to Nepal. Once they get to be 5 feet (1.5 meters) long, they are released into the wild. They start out in an enclosure to adjust to the new environment and then release themselves after a few days. Just past the breeding center you’ll also find Balmiki Ashram, a Hindu pilgrimage site where newlyweds come to pray to ask for a baby. Upon arriving at Tigerland Safari Resort, I was greeted with a cool rag and fresh orange juice — a much needed and refreshing welcome after a long, sweaty journey there. Off in the distance, elephants were nibbling from the trees. The humidity is high here (you are in the jungle after all) but thankfully there is air conditioning in each of the cottages. The activities I mentioned above were all through Tigerland Safari Resort, and they have even more options to choose from, like boat safaris, walking safaris, and bird watching. Check the latest prices and plan your preferred activities. Don’t forget to bring a flashlight! In the foothills of the Himalayas in southern Nepal sits Lumbini, the birthplace of Buddha. The entirety of Lumbini is a UNESCO World Heritage Site, and it’s one of the holiest places in the world. Throughout Lumbini there are temples, monasteries, and stupas built by Buddhist communities from countries around the world, which are all located in an area surrounding the birthplace of Buddha that is known as the monastic zone. There are no shops, restaurants, or hotels allowed to be built within this sacred zone. Regardless of religion, the concept of these communities from around the world all coming together in this one peaceful place is truly a special experience. Buddha Maya Garden Hotel is a peaceful place to rest up after a long day exploring the monastic zone of Lumbini. The service was pleasant and the food offered a refreshing variety from many of the same meals eaten along the trip. Check prices on Booking.com to find the best rates for your trip. The heart of Nepal is where you’ll find Pokhara, commonly known as the gateway to the Annapurna Circuit. The drive is a stunning one from Lumbini to Pokhara along the Siddhartha Highway, with plenty of views of the Himalayas along the way. This is the city where many trekkers stay before or after their trek, and it was once a lively trading route connecting Tibet and India. As the second largest city in Nepal after Kathmandu, it is a pretty crowded city but it’s not quite so chaotic. Pokhara was one of my favorite places in Nepal, as I loved the contrast of city life with nature. Rooms feature private balconies with garden views, air conditioning, and luxurious ensuite bathrooms. The WiFi wasn’t the greatest in the rooms, but it worked okay on the balcony and was even faster from the main lobby. Check the latest rates here for your stay. To return to Kathmandu, I recommend booking the short flight from Pokhara. The drive can take six hours even though it’s only about 127 miles (205 km) since it’s on Nepal’s busiest road. Plus, the flight has some of the best views you might see on your entire trip. This is a great time to visit some of the most popular religious sites in Kathmandu, like Swayambhunath Stupa (Monkey Temple), Pashupatinath Temple, and Bouddhanath Stupa. I recommend a guided tour for your visit, like this world heritage tour or valley sightseeing tour, because otherwise what you’re looking at may be pretty unclear. For a higher end option on the outskirts of town, try the luxurious Park Village Resort. Relax at their outdoor swimming pool with mountain views peeking out in the backdrop or enjoy the peace and quiet of their wooded gardens. They have both standard rooms and apartment options to suit your party size and trip needs. There are multiple restaurants on site as well as a classy bar and lounge in the lobby area. Rates start at $110/night on Booking.com. As I typically recommend, spend more time if you can. There are so many opportunities to try additional activities and see more sights that I wasn’t able to try out myself. Nepal is definitely not all trekking, as you’ve seen in this culture and wildlife Nepal travel guide. What are your Nepal favorites that I missed? Let me know in the comments below! Accommodations: I would recommend searching for hotels on Booking.com for the best accommodation options. They have tons of affordable choices all throughout Nepal! Gear: Any gear I bought for this trip was purchased primarily from Amazon, like my trusty Turkish towel, a compression sack, my favorite travel purse, a GRAYL water purifier bottle, comfy harem pants, and this clothes line. Nepal is another one of those places with infinite beauty…I’ve heard that the runway of Pokhara airport is one of the scariest as the plane takes off literally from a cliff! is it true? Hi Rimli! I think Lukla airport is the one that’s on a cliff. Pokhara airport is small, but it’s not scary! The runway is decent length for the small propeller planes, and take off (and the majority of the journey) is absolutely beautiful since you’re right in the mountains. Hey Marissa…fantastic post! It was so nice to meet you there. I think we were on the same trip/tour, but not in the same group. Such a beautiful place. Pictures are amazing. Thanks for sharing.